Does you employer offer a 401k plan? Have you been lazy in signing up? Or maybe you signed up, but you’re still not sure about the tax benefits of your 401k plan. With the demise of employer sponsored pensions, the 401k plan is your retirement safety net. In 1986 congress created the 401k plan to give employees a tax-advantaged way to save for retirement. There are two versions of the 401k, the tax-deferred 401k and the newer Roth 401k. Barbara’s comment; In fact, the 401k that I started during my job decades ago at San Diego State University has grown 538%, and I haven’t contributed to that account since the early 1990’s. The tax-advantaged 401k allows you to divert part of your salary into an investment account pre-tax. That means if you make $4,000 per month and contribute $400 per month to your 401k plan, then you’ll only pay income tax on $3,600 per month. In fact, a 401k plan ensures that you only pay federal or state income tax when you withdraw your money, after you retire. With this scheme, the tax rate is usually lower at retirement, compared to the rates during the period which you are still working. Your participation eligibility in the workplace 401k depends on your employer. Some companies require you to pass a particular waiting period before you start making contributions while others allow you to participate immediately. You can check the benefits enrollment requirements from your company to find out whether there are any conditions that you must first meet. As mentioned earlier, you transfer part of your paycheck into the 401k plan even before the taxes are deducted. That way, the amount of income on which you have to pay tax on is lowered, thereby netting a greater amount of pay due to lower tax payments. Roth 401k is a type of a 401k plan and acts as a reverse of the traditional 401(k). There are no tax benefits when you contribute to the Roth 401k, but the money within the account grows tax free and the future withdrawals are also tax free. 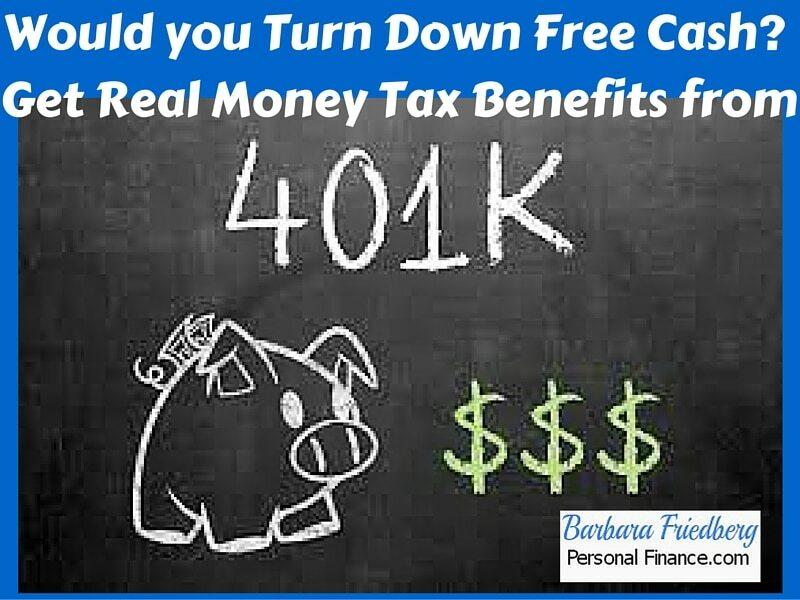 The investments held within both types of 401k plans grow tax free. That means, if you’re invested in a mutual fund which grows in value through dividend and capital gains payments, there will be no tax due on that income as long as it remains in the account. Your contribution to a 401k plan can further lower your tax bill through the retirement savings contributions credit (saver’s credit). Your eligibility for this credit depends on your income and filing status. According to the IRS.gov, this is, “A credit to help low- and moderate-income workers, who have an adjusted gross income (AGI) that does not exceed $30,000 ($45,000 if head of household; $60,000 if married filing jointly), save for retirement”. While we’re discussing tax benefits, it’s important to understand the differences between tax-deferred and tax-free investment accounts. The advantages of this retirement opportunity go beyond the tax benefits of 401k plans. The process of moving money from your bank account to that of your retirement saving is time-consuming. The 401k ensures that your savings are automatically deducted from your account rather than you having to put money aside for that purpose. It also encourages you to continue with your contributions through thick and thin. Click here for 3 free money and investing resources. In most cases, you can borrow from your account. And as long as you actively remain an employee of a particular company, you can pay back your loan without incurring income tax liability. You can, therefore, borrow money to pay for your education, purchase a primary residence, pay your medical bills or sustenance in the event of severe economic hardships. Since you’re borrowing from your own account, when the money is removed, it’s not growing or compounding, so think twice before borrowing from your 401k. You can leverage the growth of you 401k account by raising your contribution amount annually. With the 2016 contribution increment limit set at $18,000 or $24,000 if you are 50 years or older, you can set apart a tidy percent of your gross income for retirement. Most of the employers with 401k plans for their employees also offer matching contributions. This means that your employer will kick in a certain percent into your retirement account as well, up to a certain limit. Many employers cap their match at 5%. The employer match is like getting a salary increase. Even if you can’t contribute much to the account, make sure to invest at least enough to get the employer match. There is a 10% penalty on top of income taxes due if you withdraw money from your 401k before age 59 ½. Although there are limited exceptions to the early withdrawal rule. You may be in need of liquid cash, but the stringent rules that come with 401k plans make it quite costly to withdraw money early from your 401k. Some 401k plans don’t offer the best or most cost effective investment choices. If your employer charges high fees for the plan or doesn’t offer your preferred funds, consider investing only up to the point of receiving the employer match. Make sure that you understand the consequences of early withdrawal from your 401k. Save enough money outside your 401k for emergencies and unexpected expenses. Due to the outrageous borrowing rules, early withdrawal penalties and the formidable taxes, the early exit strategy from your 401k is a costly one. Who doesn’t love free? Click here for free investing eBooks and courses. About the author: Rick Pendykoski is the owner of Self Directed Retirement Plans LLC, a retirement planning firm based in Goodyear, AZ. He has over three decades of experience working with investments and retirement planning, and over the last 10 years has turned his focus to self-directed accounts and alternative investments. Rick regularly posts helpful tips and articles on his blog at SD Retirement as well as Business.com, Biggerpocket, SocialMediaToday, WealthManagement, SeekingAplha, and NuWireInvestor. You can email him at rick@sdretirementplans.com or visit www.sdretirementplans.com.